The AR-15 is a great weapon to have for competitive shooting, hunting, and defense or work, but its different operation and configuration can be confusing to people new to the platform. To help with all the nomenclature specific to the AR-15 platform, we thought it may be beneficial to offer a brief dictionary for those who are interested in seeing if this excellent weapon will meet their needs. Lower Receiver-The lower half of an AR-15. DTI offers lower receivers in 3 formats: stripped, complete (with installed lower parts and grip), and complete with buttstock. 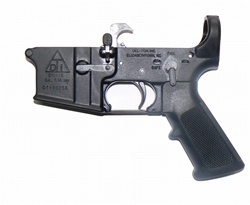 This is the part of an AR-15 that is subject to the ATF performing a background check before it can be transferred to a customer through an FFL dealer. All other parts of the AR-15 are simply considered “parts” and can be sold directly to a customer. Upper Receiver-On our website, this typically denotes the upper receiver itself (we use the term “custom uppers” or “barrel assemblies” to describe a complete upper receiver half—from upper receiver to muzzle). 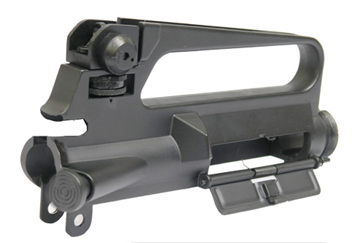 A2 Upper Receiver-An upper receiver with an integral carry handle/rear sight. 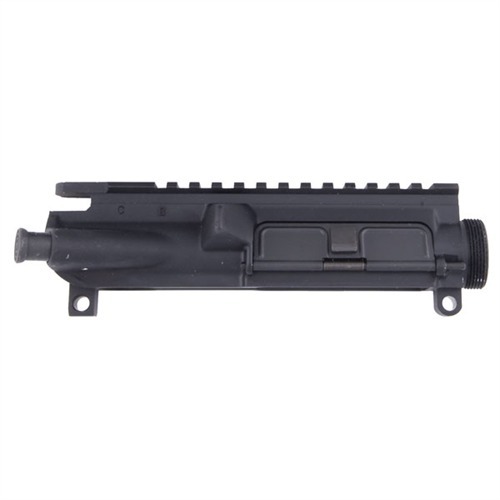 Flat Top Upper Receiver-An upper receiver that does not have an integral carry handle/rear sight or rear sight of any kind, but rather a picatinny rail for the attachment of sights or optics (also termed an A3 or A4/M4 style upper by others). DTI offers them with or without M4 feed ramps. All of our flat top uppers have “T-Marks”, which are white, etched numerals on the rail so that sights that have been “sighted-in” and later taken off can be reattached at their previously “sighted-in” position. M4 feed ramps-A flat top upper receiver that has extended feed ramps machined into the upper receiver for more reliable feeding of all types of ammunition, especially when the weapon is excessively dirty. Front sight base/FSB-the triangular shaped base mounted by taper pins on our barrels. There are two designs available at DTI. 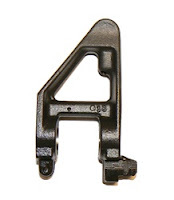 Standard front sight bases are used with A2 upper receivers, and F-marked front sight bases are used with flat top upper receivers for proper rear/front sight alignment. The front sight base serves as a “gas block” to channel the gas from the fired round back through the gas tube and into the bolt carrier key to cycle the bolt assembly for ejection and subsequent feeding of the next round. There are other styles of "gas blocks" available for AR owners whose application would be better served by not having a typical front sight base. Chrome moly/chrome-lined barrels-All DTI barrels are produced from chrome moly vanadium steel. We also offer many of these same barrel styles with a chrome-lined bore and chamber as an optional feature. Many experienced AR-15 users and designers believe that a non chrome-lined barrel may be more accurate, but chrome-lined barrels may have greater longevity. As with any choice regarding AR-15 options, the user’s particular application is the most important thing to consider when deciding which barrel will best suit his or her needs. Barrel Twist Rates-The number of revolutions in inches in the rifling of a barrel. At DTI, we offer chrome moly barrels in a 1X9 twist rate, and most chrome-lined barrels in both 1X9 and 1X7 twist rates (Example: a 1X7 twist rate barrel would have one revolution of the rifling in every 7 inches). The prominent "train of thought" is that the faster twist rate (1X7) is more accurate with the heaviest bullets (62-77 grain), while a slower twist rate is better with lighter weight bullets (45-62 grain). DTI rifles with a 1X9 twist rate tested and featured in major weapon publications have produced sub-MOA accuracy with heavier bullets, however. Pre Ban/Post Ban-While there may be other nuances involved, “pre-ban” typically denotes an AR-15 with a bayonet lug, flash hider, and collapsible stock. Most “post-ban” rifles, uppers, barrels, etc...do not have a bayonet lug on the front sight base, have a crowned muzzle on the barrel or a permanently attached muzzle brake/compensator, and a fixed stock. The “ban” refers to the AWB (assault weapons ban) enacted under President Clinton’s administration and allowed to expire during President Bush’s administration. Some states and even local areas have similar laws still in effect. It is best to visit your state’s DOJ website or inquire at a local gun dealer regarding what is a legal configuration for the AR-15 in your area.